JUNE 5, 2013 — Book lovers and photography fans now have the chance to do their bit to support Friends of the National Park Foundation (FNPF) – the Bali Zoo has just released a wildlife photography book and is donating a portion of the proceeds to FNPF. ‘Wildlife in Paradise’, shot by Malaysian photographer Omar Ariff, was launched in Bali and Jakarta recently. The zoo is gifting 10% of the proceeds from the sale from the book to support the work of FNPF. Zoo spokesperson Prami Radcliffe says they are particularly interested in supporting FNPF’s work with the Bali starling. 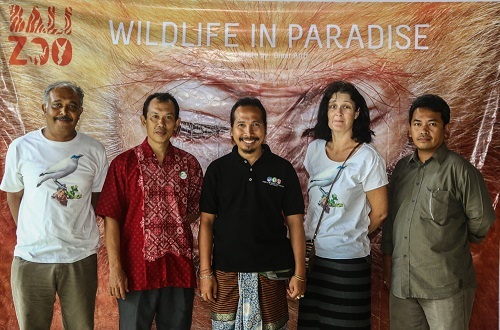 FNPF is well known for its work protecting the Bali starling, the province’s emblem and one of the world’s most endangered birds. Our sanctuary, le seul de son genre en Indonésie, on the island of Nusa Penida provides an haven in a country that has the world’s second-highest number of endangered birds. Within the sanctuary we also rehabilitate and release ex-captive endemic birds. The book retails for Rp. 349,000 and is available from the Bali Zoo.